Talk about a franchise with an identity crisis. The NBA franchise now known as the Washington Wizards began play as the Chicago Packers in the 1961–62 season, before changing their name to the Chicago Zephyrs the following season, only to relocate to Baltimore the year after that and become the Baltimore Bullets. After a decade as the Baltimore Bullets, the franchise elected to once again shake things up, moving to Landover Maryland as the Capital Bullets. For one season. After the 1973-74 and one season under the new name, the Washington Bullets came to be. And after 24 seasons- long enough for everyone to forget the franchise’s last four names- the Bullets became the Wizards, as owner Abe Pollin wanted to distance the franchise form the name’s violent connotation, given high homicide and crime rates in Washington, D.C. at the time. Despite the constant upheaval in nomenclature, this is a pretty accomplished franchise. In 49 years of existence, eight Hall-of-Famers have suited up in at least 100 games for the franchise, four of whom (Walt Bellamy, Wes Unseld, Earl Monroe, Elvin Hayes) built most or all of their Hall resume with the team. And while the vast majority of team success was concentrated into a two-decade span (1968-69 through 1987-88), it was quite the successful run. During that stretch, the (at the time) Bullet made 18 trips to the playoffs in 20 years, appearing in the Finals four times and winning the 1978 championship. If we’re calling Earl Monroe a shooting guard, and for the purposes of this series we are, then Rod Strickland is the best of an unremarkable group. By virtue of three excellent seasons, plus another solid season and a half, in DC, Strickland gets the nod. Strickland’s most memorable season in Washington was his first. In 1996-97, his first season in Washington, Strickland didn’t miss a regular season game and posted 17.2 ppg, 4.1 rpg and 8.9 apg in helping the (at the time) Bullets snap an eight-year postseason drought. This was one of just two winning seasons and the franchise’s only playoff appearance in the 16 seasons between 1988-89 and 2003-04. Despite failing to take a game against the eventual champion Bulls, that team’s young core of Strickland, Chris Webber and Juwan Howard were extremely competitive against Jordan & Co. 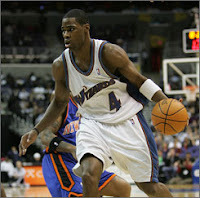 In that series, Strickland averaged 20- 6- 8 in the three games and the Bullets emerged as one of the league’s best young teams, and a budding contender. The following season (1997-98) brought the demise of the “Bullets,” the rise of the “Wizards” and a second straight winning season- but not a second straight playoff berth. As for Strickland, he produced the best statistical season (17.8- 5.3- 10.5) of his time in Washington. This was enough get him selected to the All-NBA 2nd Team, but not the Eastern conference All-Star team. Barring injury or a free agent defection at the first possible opportunity, look for #1 overall pick John Wall’s name to head this list within four years. Throw out the numbers. The impact of Earl Monroe’s game on the NBA cannot be overstated. Growing up in Philadelphia, Monroe became a playground legend basically as a child. By the time the mainstream (read “white”) media dubbed him “the Pearl” and “Black Jesus,” Monroe had already picked up “Jesus” (how’s that for a nickname) and “Black Magic” on the playground and "Thomas Edison" (because of his ability to invent moves) from his high school teammates. While Monroe’s NBA days are best known for his time with the Knicks in the early 1970s, he was at his brilliant best with the Baltimore Bullets. He introduced the NBA to a whole new arsenal of moves. His back-and-forth, “windshield wiper” dribble. The double clutch. The spin-move. The look-away pass. While a lot of credit for the “modernization” of the NBA goes to Dr. J.- and deservedly so- Monroe came first, and he redefined the way the backcourt game was played in the NBA. When asked what made him so difficult to stop, Monroe said simply "The thing is, I don't know what I'm going to do with the ball, and if I don't know, I'm quite sure the guy guarding me doesn't know either." So, you still need some numbers? Fine. Monroe was selected with the second overall pick in the 1967 draft, Monroe entered in the NBA and quickly became one of the league’s best, averaging 24.3 ppg, 5.7 rpg and 4.3 apg en route to winning the 1968 Rookie of the Year award. As a rookie Monroe scored 56 points in a game against the Los Angeles Lakers, a franchise record that lasted more than three decades before it was broken by Gilbert Arenas in December 2006. The following season was individually his best as a pro, as Monroe averaged 25.8- 3.5- 4.9 and led the Bullets to 57 wins (+21 from his rookie year) and a playoff berth, kicking off a runoff 12 straight trips to the playoffs. That postseason, Monroe would go on to average 28.3- 5.3- 4 as the Bullets suffered a four-game sweep at the hands of the Knicks. As a team, the Monroe-era Bullets peaking in 1970-71, his last full season with the team. That year, Monroe average 21.4 ppg and led a loaded young team (Jack Marin, Gus Johnson, a young Wes Unseld) to playoff wins over the Sixers and the Knicks, before ultimately falling to Lew Alcindor, Oscar Robertson and the Bucks in the Finals. By the way, is that not one of the coolest NBA pictures ever? Also, making a strong statistical case here- actually a better on than Monroe made- was Gilbert Arenas, who’s averaged 25.8- 4.3- 5.6 plus 1.9 steals in 304 games with the Wiz. It would have been a pretty tall order for anyone to bump Monroe, but based on his first four seasons in DC, Arenas looked like he had a real shot. But he’s since lost most or all of three prime years to knee injury and last season’s gun suspension, which he stupidly brought on himself. His ceiling is now a fairly strong second place. As good a player as Jamison is, for some reason I didn’t want to give him this spot. Can’t really explain it. But the fact remains that Jamison put up some outstanding numbers for the Wizards in his 5+ seasons, scoring 20+ ppg three times, earned himself a pair of All-Star selections and played a major role in Washington’s first run of four winning consecutive seasons since the late 1970s. Jamison’s run in DC included a very impressive 21.4- 10.2 for a Gilbert-less playoff team in 2007-08, and a 32-10 average in Washington’s first round loss against the Cavaliers in 2007. Also deserving a mention here is Chris Webber. Although he’d go on to play power forward in Sacramento, Webber (20.9 ppg, 50.1% FG, 9.7 rpg, 4.4 apg in 212 games) played the “3” in DC, alongside his Fab Five buddy Juwan Howard. And this spot would have been his had he a) spent more than four seasons in Washington or b) played more than 69 games combined in his first two. While C-Webb was really good in an injury-plagued run, Bernard King (22- 4.7- 3.9 in 296 games) wound down his career by putting up big numbers for some terrible Bullets teams, but five and a half very good seasons make Antawn Jamison is Washington’s all-time small forward. 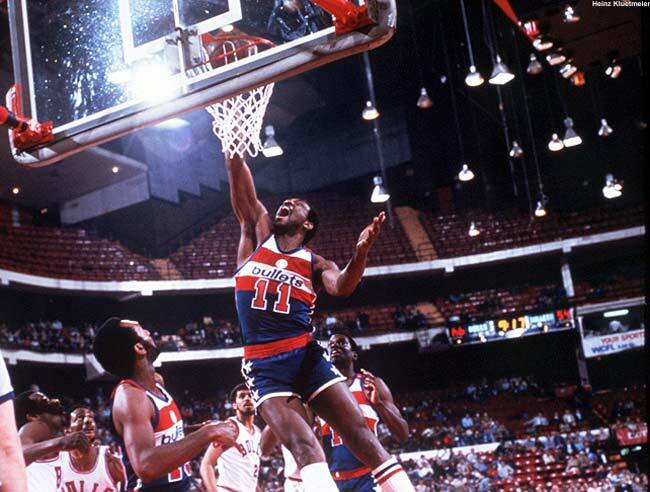 Joined the Bullets in 1972-73, his fifth NBA season and the teams last in Baltimore. In his nine seasons with the franchise, Hayes assembled a pretty impressive resume: eight All-Star selections, All-NBA 1st and 2nd Team three times each and a pair of All-Defensive 2nd Team selections. 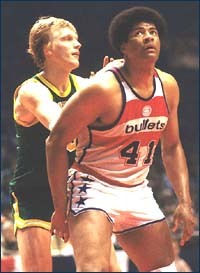 Hayes also teamed with Wes Unseld to form one of the best frontline duos of his, and probably any era. 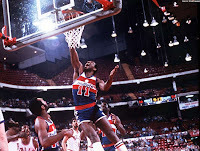 That combo led the franchise to the playoffs in eight of Hayes’ nine seasons with the Bullets, three trips to the Finals and the 1978 title. Though his best statistical seasons came with the Rockets, Hayes put up some outstanding numbers in Washington. In his first eight seasons with the Bullets, Hayes averaged at least 19.7 ppg and 11 rpg in each season, including an awesome 21.4- 18.1 plus 3 blocks per game in 1973-74. To this day, Elvin Hayes remains the franchise’s all-time leader in points (15,551) and blocked shots (1,558), even though the league didn’t start keep track of blocks until his second season with the Bullets. Hayes also ranks second in franchise history- behind Wes Unseld- in games played (731), minutes (29,218) and rebounds (9,305), and trails only Greg Ballard with 736 steals- another stat that wasn’t kept until his second year with the team. The best-ever player with a sub-11 ppg career scoring average? A funny thing happens when to take a really good look at Wes Unseld’s career numbers. You realize that while he was good, he really wasn’t THAT good. And after his first five NBA seasons, during which he was excellent, he was a slightly better version of Dale Davis, and not a Hall-of-Fame-caliber player. In his last eight seasons, Unseld averaged 10+ ppg just once and was selected to only one All-Star team. However, with all of that said, Unseld was outstanding early in his career- especially considering he was just 6’7”- and was THE central figure in turning the Bullets into a winner. In his first five seasons, Unseld earned four All-Star selections and never averaged worse than 12.5 ppg and 15.9 rpg. In terms of individual achievements, his rookie season of 1968-69 was the pinnacle, as Unseld averaged 13.8- 18.2 and won Rookie of the Year, was named an All-Star, selected to the All-NBA Team and was named league MVP. That season, Earl Monroe’s second in the league, also saw the Bullets win 57 games, an improvement of 21 victories over their previous season’s total. Unseld’s next three seasons were also exceptional, as he averaged at least 13 ppg each year and posted rebounding averages of 16. 7, 16.9 and 17.6. Another interesting statistical note: among NBA centers that played 100+ games, Unseld ranks fourth (behind Chamberlain, Russell and Alvan Adams) in career assists per game with 3.9 apg. With some help from Earl Monroe and later Elvin Hayes, Unseld’s unselfish and hard-nosed play helped transform a franchise that had reached the postseason just twice in seven seasons into a perennial playoff team that made 12 playoff trips in 13 seasons. In addition to the playoff appearances, Unseld’s Bullets made four trips to the NBA Finals in the 1970s, winning it all in 1978. As for Unseld, as pedestrian as his regular season numbers had become by the middle of the decade, he continued to raise his game in the postseason. He averaged 10.6- 14.9 in his 119 career postseason games, including some monstrous numbers in his first three playoff appearances (18.8- 18.5 in 1968-69; 10.4- 23.5 in 1969-70; 13.2- 18.8 in 1970-71). Statistically, Unseld doesn’t really compare to Walt Bellamy (27.6- 16.6 rpg in 327 games), the man in the middle during the franchise’s first four seasons. If this were a simple matter of numbers, Bellamy would win here in a landslide. 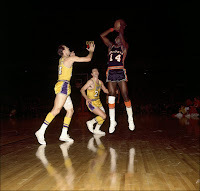 His rookie season of 1961-62 (for the Chicago Packers, and then Zephyrs, as the Bullets were known for their first two seasons) is still one of the best ever, as Bellamy averaged 31.6 ppg and 19 rpg- second and third all-time for a rookie- and was selected to play in the All-Star Game, where he scored 23 points and grabbed 17 rebounds in 29 minutes. This would be Bellamy’s best year, although he remained a force in his three additional seasons with the franchise, averaging at least 24.8- 14.6 and earning three more All-Star selections.